Ths paper introduces an automatically eddy current tester which integrates modern electronic and microprocessor techniques. The unit is built in with battery. Therefore, it is light in weighty and small in dimension. The complete tester is fully portable and operations and the parameter settings of the tester are easily carried out with keyboard. Eddy current testing has an advantage of fast speed, high efficiency and sensitivity to defects, so that it has been extensively applied to areas of aeronautics, aerospace, nuclear and fossil powers, petrochemical, metallurgical, mechanical, and military industries. In some industries, working site of non-destructive inspection persons is not fixed, very narrow and small, site power supply is not so reliable, and the inspection equipment always needs to be moved from one place to another etc. These many reasons force non-destructive inspection persons, who specially serve in military force, to select portable eddy current equipment with compact size and fully automatic operation. A new type of intelligent and fully automatic eddy current tester has been developed by EDDSUNS Electronic Company Ltd. and it will be described in this paper. Digital control technique: full advantages of computerized and data processing techniques has been brought into full play for the tester design and for digitally control operations on the module circuits of wave generator, power amplifier, rectifying gain, phase rotation etc are used. Automation of amplitude and phase analysis: The important parameters characterizing a defect are its phase and amplitude. Their measurement and analysis are automated in the tester with a few function keys. Besides, suitable X and Y strip curves as well expansion analysis picture can be obtained for further ancillary analysis and discrimination of defects. Digital zero adjustment: In eddy current testing, when there is no defect under the eddy current probe, main or referenced eddy current signals shall be adjusted to zero and this corrected parameter value shall be kept during the tester working time. Therefore, a fast digital zero adjusting circuit is designed to solve the zero point drift effectively. Digital filter: In addition to a tangible filter circuit is designed, software filter is also adopted in the tester to help eddy current signal processing with fast CPU. The weighty of the equipment is light and its size small and a rechargeable battery is built in it, therefore it is an ideally portable eddy current tester suitable to field applications. Through a simple training it can be operated by technicians with facility. There are two types of the automatic eddy current testers, EEC-99/XJ with single frequency and SMART97 with multiple frequency. EEC-99/XJ in Fig. 2 is made up of single CPU controlling and processing eddy current data and it can be used in small and hard working space. A small probe of the tester collects calibration signals into the sampling module of EEC-99/XJ. After through data processing and analysis module, calibration, phase recognition, sensitivity setting and determination of alarm threshold value are automatically completed and stored. While the tester probe detects a defect on the tube material being tested, an alarm light is flashing if the processed defect signal exceeds the setting threshold value. So the inspection process is very simple and easily operated by several keys. SMART97 in Fig. 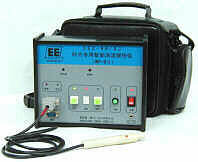 1 is a sophisticatedly multi-frequency eddy current tester. 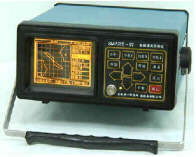 For certain expert experiences have been included in it, it includes the selection of different frequencies applied to the material being tested, respectively combination and mixing among them to reduce some disturbance signals and defects discrimination according to eddy current characteristics caused by different frequencies on the same defect etc. These expert experiences with help menu can be stored in the tester. When an operator uses them in accordance with the selected expert program, they will guide the operator to detect and recognize the defects with sound, light and electrical alarms and warnings for reanalysis. Internal surface crack inspection of rivet and stud hole in service condition. Surface crack inspections of various metal parts and ferromagnetic welds. Thickness change inspection of thin plates (wear, corrosion and mechanical fretting etc). Thickness measurement of non-conductive coating layer or platting layers on conductive materials. Gap corrosion inspection between layers of composite materials, for example, multiple layer structure, aluminum envelopes and connectors among fuselage and wings of airplanes. In-service inspection of heat exchangers tubes made of non-ferromagnetic materials (copper, titanium, aluminum, zirconium etc). Monitoring of the changes of material heat treatment and sieving. With development of science, technology and quality awareness enhancement, more and more attentions to nondestructive testing are being extensively paid. The common goal of every eddy current equipment suppliers and users is to develop a small, intelligent, portable Automatic Eddy Current Equipment. In order to let users get the eddy current equipment with more high proficiency and to continuously meet user more and more high requirements, the eddy current equipment will be constantly improved, and new ideal will be brought into it on the basis of experience feedback collections and accumulations. Chen Kaihui etc, "The Eddy Current Inspection of Titanium Tubes of The Condensers in Guangdong Nuclear Power plant", Non Destructive Testing March 1995.